I’d like to introduce you all to… (drum roll, please!) our first guest blogger here on Lifestyles– Andrea! (imagine large round of applause here) Andrea is a wife, mother of two, and writer extrodinaire. She has just finished her first book of non-fiction and is currently working through the editing process (ugh.) She’s moonlighting here as good old-fashioned Midwestern girl, no-nonsense cook and clever lass. 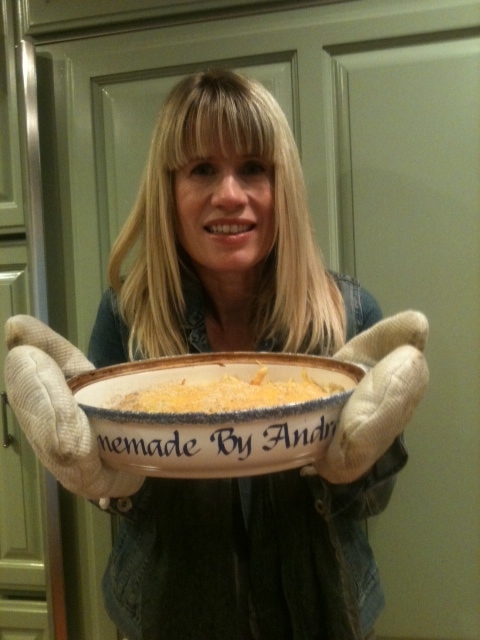 Please welcome Andrea to Lifestyles of the Destitute and Obscure and enjoy her recipe! California is not a casserole state. In this temperate climate, people crave lighter fare, the kind that you can eat before going for a 5 mile jog. Back in the Midwest where I am from, casseroles are a food group. You can find recipes for them in any church or Junior League cookbook. They all contain at least 2 cans of cream soup, a stick of butter, and some rice or noodles to soak everything in. My favorite recipe is for chicken broccoli casserole. It is the only recipe with more than three ingredients that I know by heart. I’ve made it for boyfriends, new moms, new neighbors, and myself on rainy cold days. It’s satisfaction in a warm rectangular dish. Actually, it offers more than satisfaction…it’s a promise. A promise of being warmed, fed and satisfied. I think chicken broccoli casserole is a nostalgic experience too. Chicken broccoli casserole is a throwback to a time when people didn’t watch what they ate so carefully. Although I am a healthy eater and even a health nut at times, I am jealous of my grandmother, who could feed her children brownies as an after school snack and be considered a good mom. Give your children cookies after school now and you either need to apologize for it or hide it completely. Chicken broccoli casserole isn’t vegan, vegetarian, or low carbohydrate, so I feel a little like I’m rebelling when I eat it (and I like rebelling). There are enough ingredients in it for people to disapprove of without shortening my life span. Yet it can also turn vegetable nay-sayers into vegetable lovers. My mother-in-law once made it for her cousin, a veteran gambler who once drove right past the Grand Canyon without looking at it in order to get to a casino. He now says it is the only way he’ll eat broccoli. Like Jell-o, chicken broccoli casserole is not hip. It is not the kind of thing you bring to a party in the city. It might offend people who have sworn off most of its ingredients, or people who are used to restaurants in Napa. Sometimes I think that in the search for answers to the big questions (What is my purpose? Why are we here?) people respond with smaller absolutes, like absolute truths about what you should or shouldn’t eat. Truth with a small t is much easier to claim than truth in caps, but is almost as difficult to prove as larger assertions. And that is why I KNOW that chicken broccoli casserole is good for you, and you should try it. If using cooked rice, spread out in the bottom of a rectangular casserole pan or dish. Steam the broccoli to crisp-tender, cut into small florets, and layer over the rice or at the bottom of the pan. Cut or shred the chicken into small chunks, and layer over the broccoli. Prepare the sauce by mixing the soup, mayonnaise, lemon juice, and a couple of shakes of nutmeg, and pour over the other ingredients in the pan. Spread the shredded cheddar** evenly over the top. Sprinkle breadcrumbs over the cheddar, and bake in a 350 oven for about ½ hour – casserole should be hot in the center. After the casserole is baked, be careful to let some of the crispy cheddar cheese stick to the casserole pan as you serve out the portions. It’s almost like candy for the cook– those greasy, crispy globs of cheddar. Don’t let anyone else see you, or you will have to share. 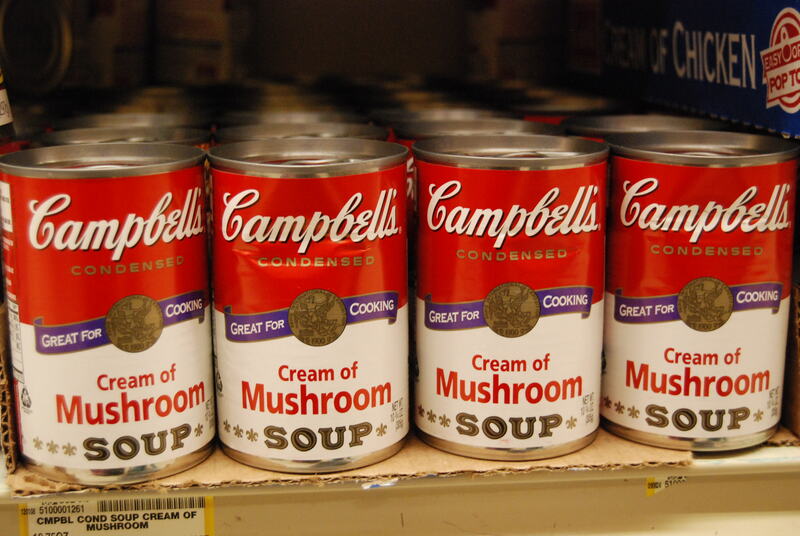 Note: Ms. Destitute realizes that the picture of the soup cans (think Andy Warhol goes to Illinois) is of Cream of Mushroom soup, not the Cream of Broccoli called for in Andrea’s recipe. Follow her recipe first. But I’ll just bet that the Cream of Mushroom would be delicious, too. Ms. D takes all the credit for the mix-up, but asks to be excused, as she felt rather conspicuous taking pictures in the soup and coffee aisle of the grocery store while her preschooler rolled about on the linoleum floor. Thanks for the support! Cioa and chow! Sounds yummy, having never made a casserole this recipe is mighty tempting for this reluctant cook. Way to go dynamic duo! Awww, thanks for the love ya’ll. I’ll pass along a hug to Andrea.